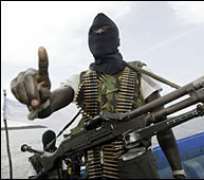 Violence in Nigeria's oil region left 1,000 people dead and cost $24bn (£16bn) last year, a report says, according to an official and activist. Ledum Mitee, chairman of the Niger Delta Presidential Technical Committee, says the figures only cover the first nine months of 2008. Militants and criminal gangs often attack oil installations, leading to reprisals from the military. The unrest has cut Nigeria's oil output by about 25% in recent years. Last week, President Umaru Yar'Adua said his government was considering granting amnesty to violent groups if they disarm. The report, prepared for the federal government, has not been published but Mr Mitee has been reading sections of it to various media. "Attacks on oil installations resulted in shutdowns and spillages with consequent losses in revenue estimated at about $20.7bn (£14bn)," he told the AFP news agency. He has said that oil worth a further $3bn (£2bn) was stolen. "There are unaccounted costs in human misery, with about 1,000 persons killed within the same period of January to September last year, and another 300 taken as hostages," he said. Mr Mitee, who is also president of the Movement for the Survival of Ogoni People (Mosop), has been quoted as saying that the figures show it would be worthwhile "buying peace". Some of the militants say they are fighting for a bigger share of the oil wealth for people living in the Delta. But others use an almost complete breakdown in the rule of law to make money by extortion, oil theft and kidnapping. The most visible group, the Movement for the Emancipation of the Niger Delta (Mend), has dismissed President Yar'Adua's offer of an amnesty.